This post expands on (and updates) a few of my earlier posts about developing for the STM32F0 microcontroller. Some parts have become easier and I've found a few more useful ways to get things done. Some of the commands below assume a Debian-based Linux distribution, but should be reworkable for your particular setup. We're now ready to build and flash some firmware. I'll cover three ways to accomplish that: using the command line, using the Geany IDE, and using the Eclipse IDE. For a very simple workflow you can just use the command line to get everything done. Write your code in whatever editor you like, and use a Makefile to encapsulate all of the build, debugging and device programming commands. 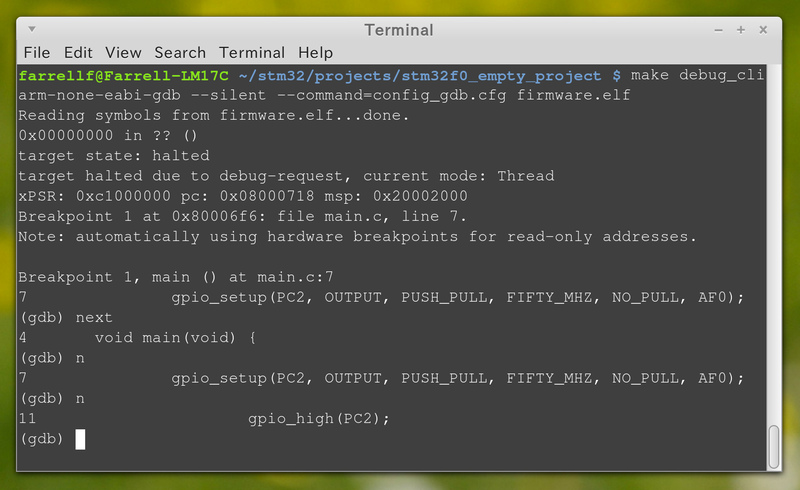 make compiles the firmware into an ELF and a BIN. make install flashes the firmware to the STM32F0 with OpenOCD. make clean deletes the ELF and BIN. make debug_server, make debug_nemiver and make debug_cli are used for debugging. More on this in the debug sections below. 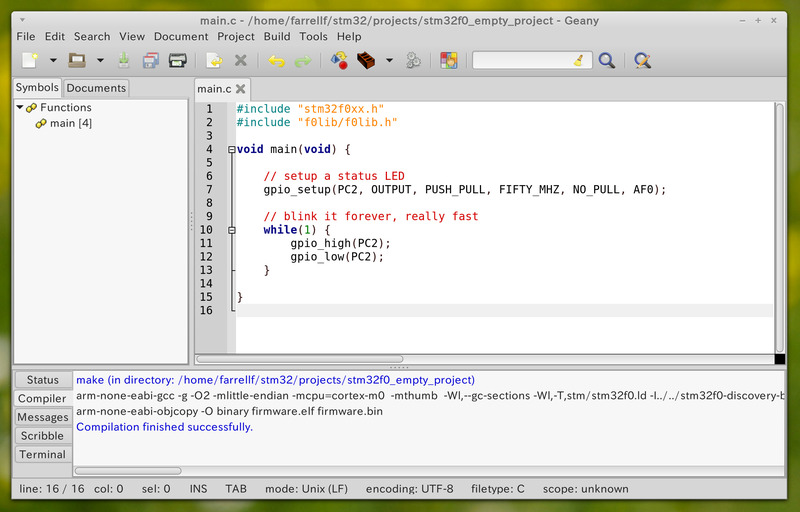 Geany is a simple IDE and perhaps my favorite environment for programming in C. The IDE is essentially a text editor with a few extra features to support coding. It's minimalist and very fast. The only settings you need to change are the build commands. Go to Build > Set Build Commands. Configure them as compile = make clean, build = make, execute = make install. While this might sound weird, it makes the three build icons in the toolbar perfect for one-click actions instead of having to use the drop-down build menu. Side note: if you're using Cinnamon or Gnome3 with a high-DPI display, the experimental GTK3 support in Geany gives you a beautiful high-DPI-friendly IDE. You'll have to build Geany from source with ./configure --enable-gtk3 && make && make install. Many people prefer the Eclipse IDE. 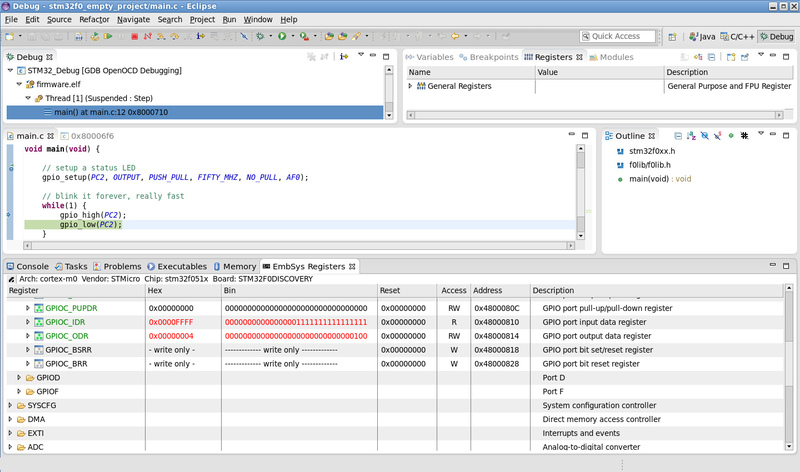 While I don't care for it's busy interface and relatively sluggish performance, there is a must-have plug-in that gives awesome annotated register views in the debugger. Start by installing the Eclipse and CDT packages, then install the GNU ARM Eclipse and EmbSysRegView plug-ins. Don't install Eclipse from the repositories -- the repo version of Eclipse is a few years old. Again: I only use Eclipse for debugging. If you actually want to do any development in Eclipse, don't do what I do. You can now debug using step/next/etc. Double-click on registers in the EmbSys Registers tab to view their contents. It automatically updates as you step though code. make debug_server will have to stay running for the duration of the debugging process, so run it in a separate terminal window. After closing Nemiver you can close the server with Ctrl-C.
make debug_server will have to stay running for the duration of the debugging process, so run it in a separate terminal window. After closing gdb you can close the server with Ctrl-C. 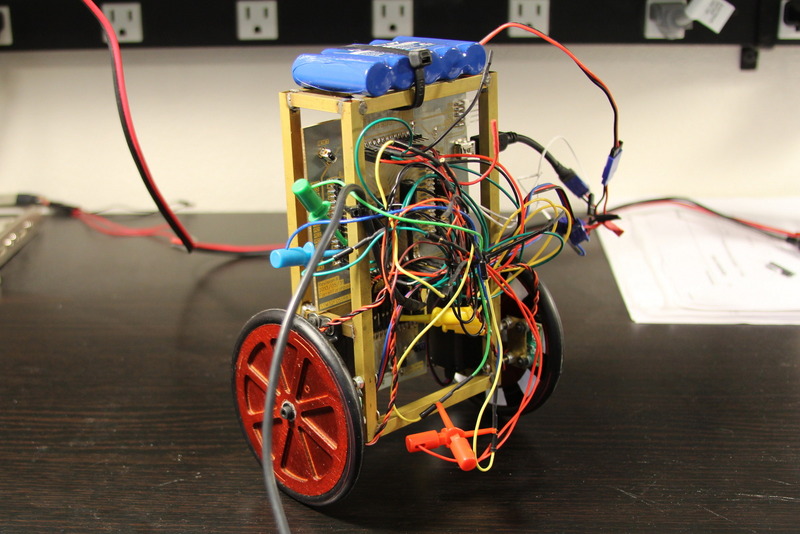 While developing my balancing robot I needed to visualize certain variables. Being able to monitor angles, velocities and feedback loop factors made it easier to tune the control loop and verify the correct functioning of my sensors. I wrote the program in Java, utilizing the Swing and RXTX libraries. Current values for each data point are shown with the sliders and text labels. Clicking on a data point will bring up a new window that shows the history of that data point in the form of a line graph. Multiple line graph windows can be used to track the history of several items at once. The source code can be downloaded as a zip file, or accessed through my RS232 Telemetry Viewer repository on GitHub. To run the code you will need to install the RXTX library. 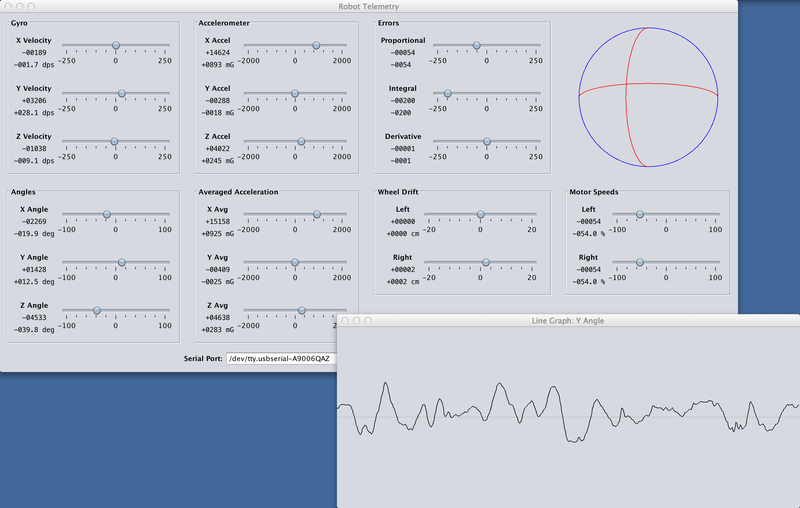 The code is split into eight classes: Main, Database, TelemetryGUI, ConfigurationLoader, SerialConfigPanel, SerialPortListener, BallPanel and LineGraph. The TelemetryGUI class has two inner classes: TelemetryGroup and TelemetryItem. Main simply creates an instance of the Database and TelemetryGUI classes. Database is used to store the history of values for each data point. TelemetryGUI configures the main window and creates an instance of the ConfigurationLoader to read the configuration text file and make the corresponding panels. A BallPanel is used to visualize the robot's pitch and yaw angles. A SerialConfigPanel shows the available serial ports and baud rates, and allows the user to establish a connection with the selected port. SerialPortListener is used to spawn a new thread that monitors the RS232 link, interprets incoming text, and populates the database with new values. LineGraph is a window that shows the recent history of an item in the form of a constantly updating line graph. 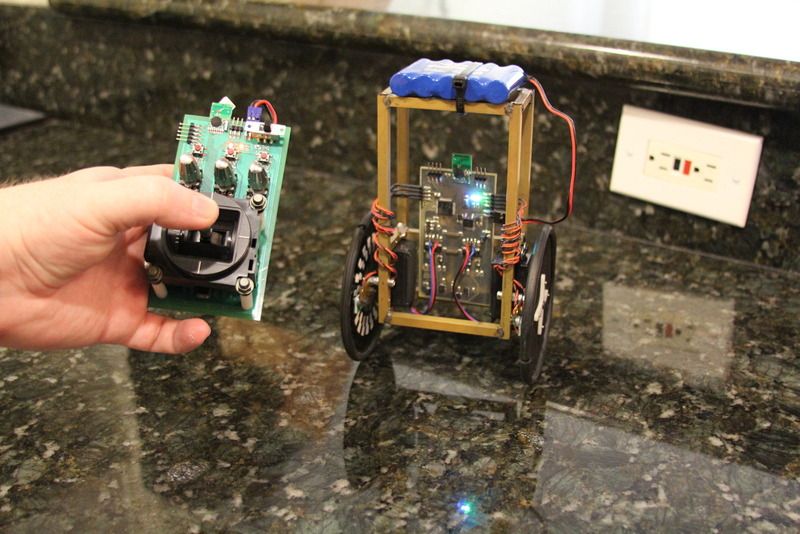 I'm releasing the firmware for my balancing robot into the public domain. Use it however you wish. The code is rather specific to my choice in microcontroller and sensors, but it might still be helpful to those working on their own robots. Most of the work takes place in two files: main.c and isrs.c. The main() function does all of the initialization work, then enters an infinite loop that constantly streams telemetry data out via RS232. The interrupt service routines in isrs.c are where all of the “real work” is done. 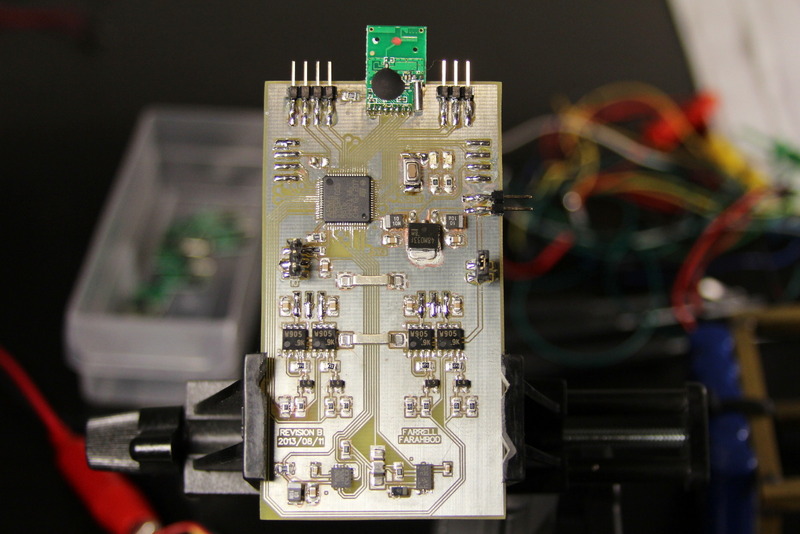 That's where the new values from all sensors are read, steering and throttle commands are received from the CC2500-based 2.4GHz transmitter, and the motor PWM values are adjusted based on a PID control loop. 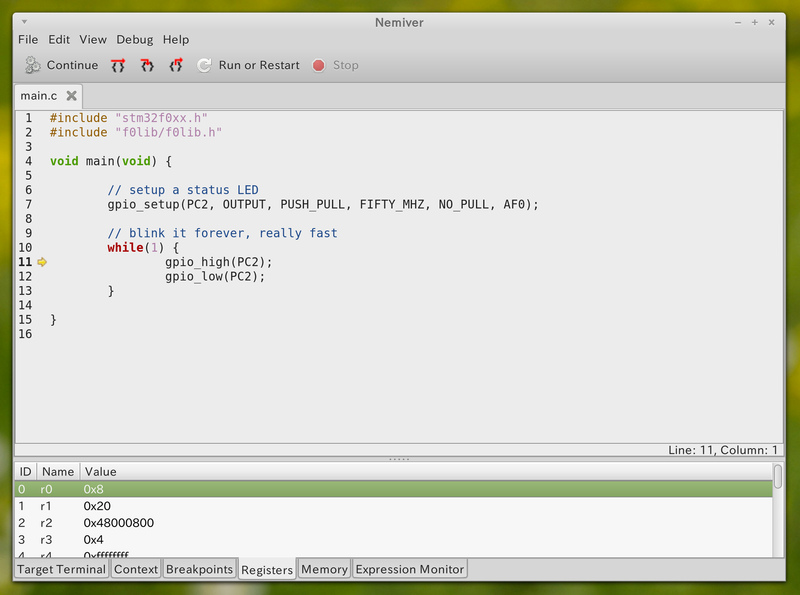 I have amassed a small collection of reusable code while working on various projects with the STM32F0 microcontroller. This collection of code is not polished enough for sharing, but since it was used in this project I am including it anyway. It's in the /f0lib/ directory and should be used with caution. Be sure to read the function implementations before reusing the code in your own projects. The code in /f0lib/ was only written with my particular use cases in mind. The firmware can be downloaded as a zip file, or accessed through my Balancing Robot repository on GitHub. Have fun! Video clips and more photos are in my previous post from May 18th. Over a year ago I started to work on a small balancing robot. Between learning more about communication protocols and feedback loops I also had periods of schoolwork that kept me from this hobby. In the end my little robot was balancing on his own and I could send steering and throttle commands wirelessly. This project marked many firsts for me. It was the first time I made use of my microcontroller's I2C, UART and ADC peripherals. It was the first time I heard about PID control loops. It was also the first time I used an RF module to communicate wirelessly. As I progressed I took several photos and video clips when milestones were met. During the planning stage I selected a 3-axis gyro and a 3-axis accelerometer. I settled on STM's L3GD20 and LSM303DLHC devices. I laid out and etched a breakout board for them, then wrote a little Hello World test to draw bar graphs for the gyro readouts. I decided to use a pair of RC hobby servos to power the robot. I removed the feedback potentiometers and modified the output gears to allow for continuous rotation. Some steering wheels from RC hobby transmitters were initially used as the wheels. The robot frame was constructed with some brass square tubing cut to length and soldered together. A gimbal was used for steering and throttle inputs since I didn't want to dive into the 2.4GHz module's lengthy datasheet until the end. The wheels quickly proved to be a problem. While they had great traction, their diameter was far too small. The robot could easily drift a little too much, and the servos at full power couldn't spin fast enough to overcome the drifting. The robot was actually drivable at this point. I added optical wheel encoders to make it easier to sense when the robot started to drift off course. Without the encoders the robot could drift if the driving surface wasn't perfectly level. By now the little guy was a mess of breakout boards, flying wires and extensions. To clean up the mess I designed and etched a PCB specifically for this robot. I incorporated dual H-Bridges on the PCB to give better control over the motors. Previously I had just generated servo signals and let the servos' PCBs control the motors. This mostly worked, but as the servo PCBs came up to temperature the signal center point would drift slightly. This meant that after about a minute of use the robot would effectively have a bit of steering and throttle applied. I finished by designing and etching a PCB for the transmitter. That was shown in my earlier post about solder masks. A little tuning of the PID control loop brought everything together and I was done. I'll post the firmware in a few days after doing the last bits of clean up and documentation. There are several libraries for Java that add support for serial ports, and a few months ago I settled on the RXTX library. Recently their web site disappeared and looking back at the code releases it became apparent that development halted a couple years ago. A few groups are still maintaining packages for the library, and people still use it, so I'll post my installation and helloworld notes. An OS X installation is not so easy. Binaries are available from the official RXTX web site, but they are outdated and not compatible with modern versions of OS X. Compiling from source isn't hard, but there are a few changes that must be made along the way. Assuming you already have Java installed, you'll need to install libtool via Homebrew because the stock libtool supplied by Apple won't work. The official RXTX wiki has some good examples. Below is an adaption I made with the explicit goal of being short and to the point. See the official examples for better error handling and other use cases. The following class has two methods: Use getSerialPorts() to get a List<String> of detected serial ports. Then call establishConnection() to make a connection and create the input/output streams. For example, calling establishConnection("/dev/ttyUSB0", 9600); would connect to /dev/ttyUSB0 with a 9600 8N1 configuration. I also setup a Scanner to make it trivial to parse incoming data.